Screen door tracks and channels are used as the bottom rail for the screen door to ride on, and for the top track that guides the top of the door. The channels are also used on the door jambs to provide a way top get the screen door to fit snugly against the side jambs. If the tracks the door rides on are broken the sliding screen wont work at all. 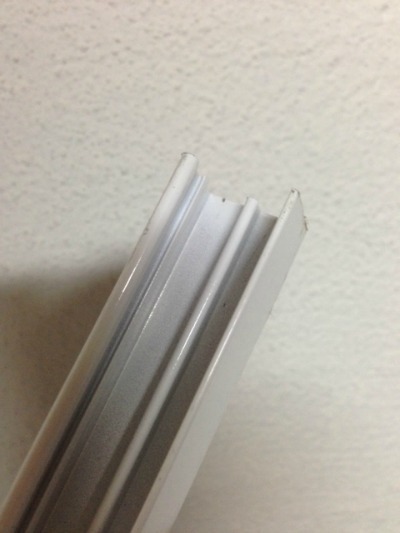 In many cases the top track in a patio door is made of PVC plastic. It gets brittle and chipped in the sun and the top of the door slips out of the track or just falls out completely. Or you have a french door and it may not have tracks at all. Perhaps the builder got a deal on French doors without screens and now you are left with the problem of installing new ones. My track kits are designed to help with those issues. The most popular one is my top track kit which allows you to replace the top track for your sliding screen with a strong white painted track made of extruded aluminum. It comes 80 inches long, you just need to cut it to length and install it with screws into the header. The top track works with a lot of french doors too because often they have a screen track on the sill plate at the bottom but no track at the top. The top track is a C chaped channel with a track running down the whole length in the center of the "C" shape. 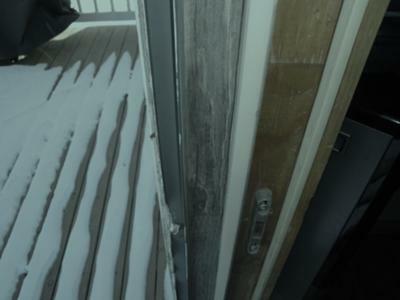 The track allows the top of the screen door to slide without banging into the screws that hold the track on to the top of the door and making an annoying clicking sound. To install one of my channels you first measure the top of your door in between the vertical jambs. Then cut your track 1/16" shorter so it fits right in the space. Measure 3 times cut once. 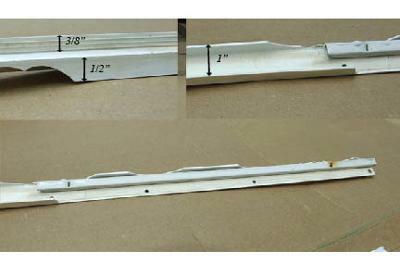 The top track kit consists of an 80 inch long piece of top track. Just cut it to the length you need and drill holes for screws and install. I have recently added a bottom track as well. Same price as the top track kit. The bottom track is necessary if you have a french door with no track at all at the bottom. There is also a screen door repair kit with both top and bottom tracks. What follows below are questions people have sent me about repairing tracks. There is a form at the bottom of the page that allows you to send me your own question. It's always best to send pictures too so we can all get a look at what the problem is. is the right one ? I have a sliding screen door. The top part of the door frame has lost the track on which the screen door slides. How do I determine which track size to get. would appreciate the help so I can order it. I uploaded the pictures of the two different tracks so I could explain the difference. The first picture is my top track. 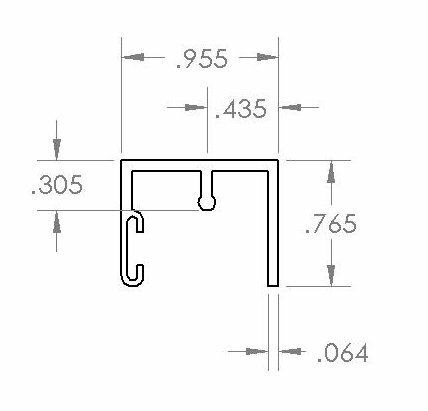 This one is usually installed on the wooden header of a french door. It needs a flat surface to screw it onto. You could use it to replace the top track on a patio door but you would need to cut away the old top track first so there was a nice flat surface to mount this track on. The other picture is the bottom track. Again this one is normally used with french doors that dont have tracks for screens. But it can also be used as the top track on a patio door. It also needs a totally flat surface to mount on. If you uploaded some pictures of the your broken or missing track area, perhaps I could give more help on how you could make these rails work for you. There is a plastic guide that the screen door slides into and it holds the screen at the top of the door. Mine has broken. I tried gluing it together and it separates. The screen gets caught and wont stay on the door. Can you replace that part? Hi Jan, I think you are talking about the top track that the screen door rides in. I do have top tracks that I can send you. Can you post a picture of the top of the door so I can see what type of track you have ? Is it possible to straighten a screen door that is bent? sticks out because it's bent. On my work van I had a trailer hitch and once in a while I would have to straighten a bent screen door rail by putting the high point of the bump against the trailer hitch and levering the free end against the bumper. You can take out some bends with this technique but some rails are so strong it requires more than human strength to straighten them. Needless to say you would have to completely dissassemble all the vertical rails from the frame to use this technique. I need to order replacement tracking. I noticed you have the part listed on your site under Missing or broken screen door tracks, part number PSDT-Top, an 8'length in white. How do I go about ordering this or can you direct me to a site? $52.99 for an 80 inch length including shipping by UPS Ground to anywhere in the continental USA. I need a new track for my patio screen door. The track i currently have is on the bottom(all i can find is top tracks) and I am not sure if that matters. The track on the bottom, is cracked, bent, the whole shabang. We just bought a brand new sliding screen door, and we can tell its the track. The track right now is metal, the new wheels are plastic, not sure if that matters also. Is this is universal part? I cant find then anywhere locally and I am worried this doesn't work, that I am out $35 bucks. I guess this is all new to me, what do you suggest I do? Is there any information I can provide you to see if this will work? Is there something I can put in the track of my sliding glass door that will make the sliding SCREEN door move more smoothly? My house is only 5 years old but but the builder used cheap materials for everything so this is not a fancy door--just standard. I keep them clean, but wonder if using something like silicone lubricant, white lithium grease or WD-40 would help, for instance. Most window installers use silicone spray to lubricate moving parts. The track is a problem because any lubricant you put there will make dirt stick to it. If the screen door does not slide easily, there must be a reason. Either bad rollers or a frame thats rubbing somewhere, or both! If you can post pictures here of the top and bottom of your screen door I will be happy to try to give more specific information to get your door working properly. I've got 15 (surplus but new) 36" white aluminum sliding screen doors, like the ones included with 6 ft sliding patio door units. To screen my walkout (lower level) 32'X 10' deck, I'd like to mount these screens on proper rails, essentially giving me a "slide open anywhere" configuration. QUESTION: Where can I buy the upper and lower rails that the screen rollers glide on? 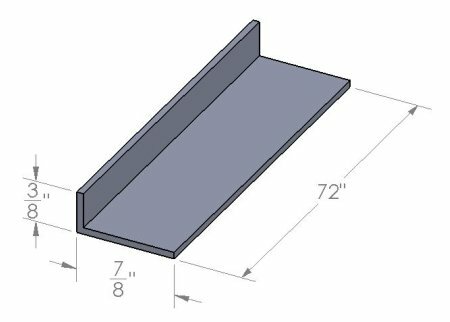 I assume that uppers and lowers are identical, but I'll need a double rail (or two single rails) for each of the upper and lower surfaces, as adjacent screens need to overlap. I'm in Ottawa fairly often, if that helps. I also have friends in Burlington, who might deliver the goods to me. The top rails are easy enough, I can supply you individual top rails in vinyl or aluminum to guide the top of the screen doors. I can also supply small aluminum angles to act as the bottom track. Give me a call at 1-866-904-2383 if you are interested in going further with this. All the plastic window screens slide in tracks which are all broken or chipped ! I do not want to replace the windows i just want buy the tracking. Yes I can get new vinyl channels for the window screens to slide in. They come in 6 foot lengths. 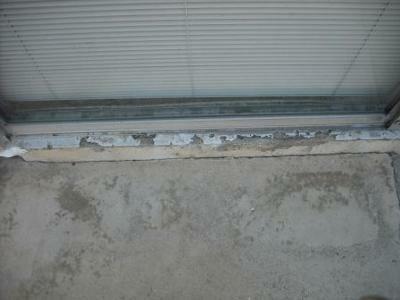 Many people have wooden windows where the screens slide in vinyl channels that are stapled to the window jambs. After a while the vinyl starts to cracks or fall off completely. They are pretty easy to replace, just cut the new channels to length with wirecutters and attach them with small nails pushed in using a pair of needle nosed pliers. I have patio door and the vinyl bottom track which the rollers glide on has an end piece broken out. When the roller reaches that point the screen pops out of the track. In your parts I see you have something called a Top Track Kit. Does this kit fit over the existing bottom track in the frame? My bottom track is vinyl molded to the door frame. The top track kit is meant to provide a top rail for those situations where the top trail has broken. I have also recently added a bottom track for applications such as yours. My bottom track is a 72" long aluminum angle 1/4" high x 3/4" wide. Normally you would screw it down to the threshold on a door that never had a track for the screen door. On your door I would remove the old vinyl track first so that there was a flat surface to mount the new track on. Vinyl tracks are easy to remove, if they are thin. Just grab the vinyl track with pliers or an adjustable wrench and twist the track off. Move the pliers along the track an inch and repeat. Take your time and you can cleanly remove the entire track. Sometimes you have to run a utility knife down the whole length at the bottom of the track to make sure it breaks off cleanly. If any rough spots are left, sand them down with rough sandpaper. 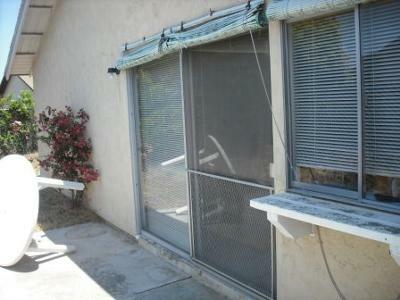 I have a client whose screen door on their sliding door has plastic channel that is approx. 3/8 x 3/4 see uploaded picture. The door is perfectly fine. I just need me to replace the channel. The box stores don't have it or know about it. My local lumber house didn't know. I thought I found someone asking the same thing on your site (A great resource for homeowners) but know I can't seem to find it or any solution that was posted. Looking for a vendor to order parts? Heres my top track. It has the track in the center but will work just the same. Any directions to get another "track" is appreciated ! We bought this house and are in need of a screen on the sliding glass patio door. We went to buy a screen got it home only to realize that there is no track for it. The only problem is we need a 1/2 inch wide lower track and not the 3/4 that you offer for purchase. Can you help? We can't find anything out West! We just had a new 8 foot patio door installed. The bottom rail that the screen door sits on has several holes in it. I am assuming this is for water drainage but these holes are quite large and we are getting a lot of flies and mosquitos in the house. I tried adjusting the screen door to sit lower on the rail but it still does not cover the holes. Is there a plug that I can buy to fit these holes? I only need to block the holes directly on the opening side. I realize we must not block the ones on the other side as it will need to drain. I checked with the guy who installed the door and he said that flies are coming in this time of year and they will get in to the smallest crevices. I explained that these holes were not small crevices and he said that I was the only one he has ever had complain of this. He also suggested that I might want to caulk these holes. Yes the holes are usually for water drainage. But underneath the holes and underneath the frame there should be a continuous bead of caulk that would prevent water (and flies) from getting in. Some flies (no-see-ums)can go right through a regular screen. There is actually finer screen material made for that purpose. No patio door is 100 percent closed to flies and mosquitoes. There are always small gaps somewhere. Most of the time flies get trapped behind the screen and zip into your house as soon as you open the patio door. I am repainting my windows and the screen/storm windows have a vinyl track system. The problem is that any time I touch these vinyl track parts they are so brittle that pieces break off. I need to replace just the vinyl side track pieces but no one seems to sell these. the rails for the screen doors? I have good hardware I think, but the screens are still hard to roll sometimes. Can you lube the bottom rails, and if so, what is best? Most window installers use silicone lubricant but anything you use will cause dirt to stick to it. Better to just clean the tracks as best you can and remove the door to actually check how easily the rollers turn. A lot of dirt gets accumulated in the recesses where the rollers are and that alone can gum up the rollers. Especially pet hair which tangles itself around the axles until the roller stops turning. Our sliding screen door was becoming very difficult to close or open. It finally popped off. The Screen and rollers seem intact. Checking the guide/channel where door fits on the bottom, we could see a strip of plastic was bent. In trying to straighten it out, it cracked into many little pieces. How do we find and/or replace this guide? Sounds like this is a vinyl patio door with a vinyl screen door track. The problem with thin vinyl tracks is that they get brittle with exposure to the sun and finally break in pieces. I usually repair them with a mill finish bottom track such as the one shown on my patio door screen tracks page. You can also find these angles at a company called "Metals Supermarket". It's a franchise that sells offcuts of metal to homeowners as well their regular machine shop customers. The angle size I use is 3/8" x 3/4" but any angle close to that size will work. You will need to cut away the old screen door track so the surface is nice and flat for the new angle to be installed. A good glass shop should be able to do this work for you if you prefer. with an aluminum on vinyl track? I have an opportunity to replace my aging vinyl slider screen doors with new aluminum doors at VERY low cost. I can't think of why aluminum sliders would not work on the vinyl track, unless there is a different roller setup, etc. Are the two interchangable? 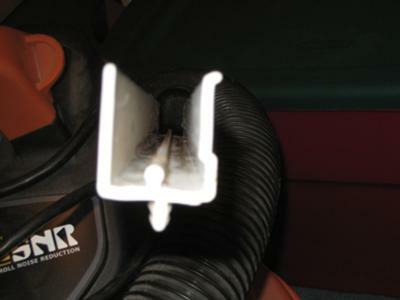 The U shaped channel that you slide the the screen door into when you close it is broken. It is glued inside the door frame. It is made of plastic and I can't seem to find one to replace it. Where can I find one of these to glue back in it's place. If your local glass shop cant help you with one of these vinyl screen channels I can send one to you. They are easy to install, usually they are screwed or stapled in place. I need to replace the top track on my sliding screen door.It's white plastic or vinyl.About 5/8 wide. Where can I purchase this . Hi Michael, The screen door top tracks are on this page. My screen door tracks are all white painted aluminum. I sell them in seven foot lengths so you can cut the track to the exact length you need with a hacksaw. Sometimes you can also find C shaped aluminum tracks in Lowes and Home depot that work well as new top tracks. The only problem is they sell them only in 48 inch lengths which means you will have to put two of them end to end. I need a 6 foot length of a plastic U channel to replace a broken channel. It is from a screen door to a Anderson patio door. The dimensions are 1 inch across and 1 1/8 down the sides. A picture of the channel is attached. 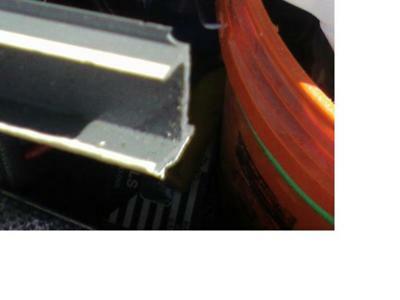 Does anybody know where I can purchase this type of plastic U channel? The U channels are white painted extruded aluminum and the dimensions are similar. I was reading on your website that you helped a woman with a broken screen channel for a sliding screen door. I also have the same problem but cannot find a replacement channel. If I upload a picture could you assist me. Hi Dave email me dunevein at gmail dot com or phone me 905-467-0233 if you need to purchase a new vinyl channel. I have heard about some people using bondo and other materials to repair aluminum thresholds, particularly since the rails are still good and the door rolls fine. Any ideas what to use and how to go about it? See pictures. I have never used that technique but I would think bondo would not be good for load bearing and would at best be a temporary solution. I have replaced many thresholds on patio doors. Your local glass shop can get new thresholds through suppliers such as CR Laurence. Might be worth just having it replaced. This screen door has been on this house for at least 20 years. Several people and at least 1 dog has slammed through it. The screen is in tack and we have no problem knowing how to replace the screen in the screen door. My questions is where do I find the channel that the screen door slides in. At Home Depot you have to puchase the entire screendoor and frame, I just want to replace the channel at the top that is chipped out. We live in Portland Oregon and I was told by a local window and screen door store that we are **** out of luck, that they don't make this channel anymore. What say you? I have attached pictures for your review. PS. I have read other people questions regarding this same issue but how do you see the answers? More questions and answers and pictures can be found on screen door repair track questions continued. Or ask your own using the form below. Its setup to make it easy for you to upload pictures.